Oil markets have leveled off, with crude oil trading flat this morning after a strong rally late Friday afternoon. Crude markets opened at $55.97 this morning, which was the highest opening price in more than two years; you’d have to look back to July 2015 to find higher prices. Crude prices are currently $55.68, a loss from today’s opening but still higher than Friday’s closing price. 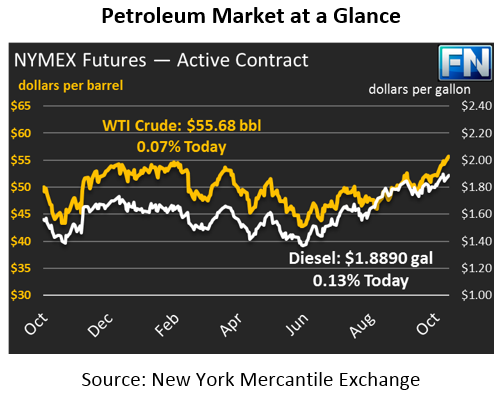 Along with crude markets, refined product markets have received a strong boost. Diesel prices opened this morning at $1.8830, their highest opening price since June 2015, when crude prices were above $60/bbl. Diesel crack spreads, the price difference between a barrel of diesel fuel and a barrel of crude oil, is higher now than it was then, as strong diesel demand has propped up prices. Diesel prices are currently $1.8890, a gain of .24 cents since Friday. Gasoline prices opened at $1.7902; excluding Hurricane Harvey’s price spike, today is the highest opening price since July 2015. Unlike diesel, gasoline has weakened relative to crude over the past two years; in July 2015 when gasoline prices were at comparable levels, crude oil was below $50; today it takes crude prices of $56 to get gasoline to these levels. Gasoline inventories remain high despite last week’s big stock draw, which has put pressure on prices. This morning, gasoline prices are $1.7913, slightly below Friday’s close. If you sensed a pattern in today’s prices, it’s this – prices are high. Markets are rapidly seeking higher ground, as we predicted they might in the final quarter of 2017. Amid strong winter heating oil demand and reduced supply from OPEC, markets are getting a major boost. On Friday, markets received an additional boost from a massive anti-corruption campaign in Saudi Arabia led by Crown Prince Mohammed bin Salman. The campaign, which has cracked down on dozens of politicians and wealthy individuals in the country, has been interpreted as a sign of strength from the prince, who has strongly supported extended OPEC cuts. Markets are continuing to price in an extension to OPEC’s cuts. Last time OPEC bid up the market like this, prices fell following an announcement from OPEC when it fell short of expectations; we’ll see if OPEC can thread the needle of not talking up cuts too heavily, while still guiding prices higher. In Nigeria, fighting has resumed between the Nigerian government and the Niger Delta Avengers. Over the past year, that conflict has caused an outage of roughly 800 thousand barrels per day (kbpd); Nigeria only just recently brought that capacity fully back online. With fights resuming, odds are good production disruption will occur again, which would send markets even higher.